Back in spring of 2012, one of our most highly-anticipated titles around TouchArcade Towers was a game called Tiny Thief (Free) by a new studio out of Barcelona named 5 Ants. It aimed to marry more traditional point-and-click adventure games with elements of stealth, and when Tiny Thief finally released in July the following year, we thought it succeeded beautifully. Sadly, Tiny Thief is currently broken on iOS 9 and publisher Rovio has no plans to fix it. However, after its release some of the members responsible for making Tiny Thief moved on to a new project which was to be a spiritual successor of sorts. 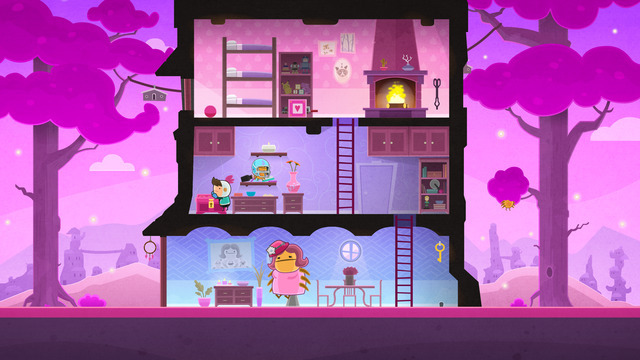 That game, called Love You To Bits ($3.99), launched this week and it’s everything you’d hope for and more as a fan of Tiny Thief or just touching, beautiful games in general. The story at the heart of Love You To Bits is adorable. You play as Kosmo, a plucky space explorer who is madly in love with his robot girlfriend Nova. Unfortunately, during an assault on your spacecraft, Nova gets blown into may pieces that spread all throughout the galaxy. Not content with losing his beloved, Kosmo sets out on a journey to track down Nova’s various bits and piece her back together, so they can continue living happily ever after. You’ll accomplish this by going from level to level, poking and prodding at each one’s environments discovering items and ultimately figuring out the puzzle that allows you to obtain the next piece of Nova. Nearly every level has some sort of nod to a famous video game, including many mobile games, and it’s an absolute delight exploring every nook and cranny and trying to pinpoint the references and discover hidden items. Those hidden items are actually mementos from your relationship with Nova, and once found you can watch little animations of when that particular item became meaningful to the couple. It reminds me (in ore ways than one, actually) of Simogo’s wonderful Bumpy Road ($2.99) and collecting that cute couple’s memories along the way. Love You To Bits is positively charming, smile-inducing, and often gut-wrenching. For being a little animated boy and his robot girlfriend, you can feel the actual love between Kosmo and Nova, making the goal of tracking down the parts and piecing her back together all the more meaningful. So far none of the levels have been particularly challenging, but that’s not really the point. The solutions are almost alway clever in a way that’s easy to appreciate, and just exploring the little world of Love You To Bits is a great reward. Fans of Tiny Thief, old-school adventure games, or charming love stories need to pick this one up right away, and don’t forget to check out what people in our forums have to say about it as well.